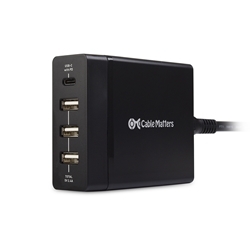 The Cable Matters 72W 4-Port USB Charger with 60W USB-C Power Delivery eliminates the need to carry multiple power adapters when traveling. This high-powered charger can power a laptop with USB-C or Thunderbolt 3 up to 60 watts. Three dedicated 2.4A USB-A charging ports provide enough power to charge two tablets simultaneously or re-charge a portable power bank and a smartphone. Charge your devices anywhere there is an electrical outlet. Use your existing USB charging cables to re-charge your laptop, smartphone, tablet, GPS, or other USB gadgets. The combination of intelligent device detection and an Energy Star rating provides a safe USB charger with protection from overcharging your device and no vampire power draw when not in use.